This Realistic tape deck was made by Teac for Radio Shack and is basically the same as the Teac X-3 model. 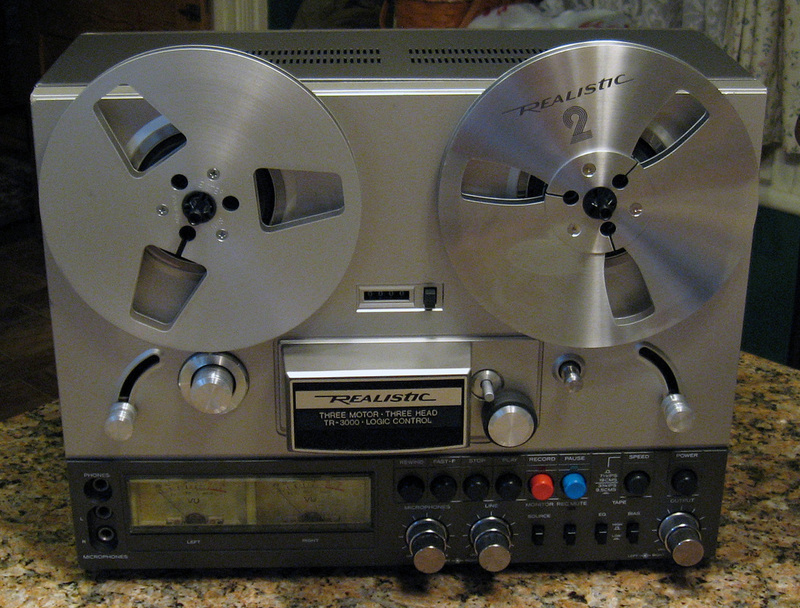 It's not a high-end deck but it is still a very nice real-to-reel with respectable specs. A good cleaning and new belts got the deck playing again, but then I noticed that both reels were not parallel to the face of the deck which seemed a bid odd. So I removed the front faceplate of the deck again to see what was up. 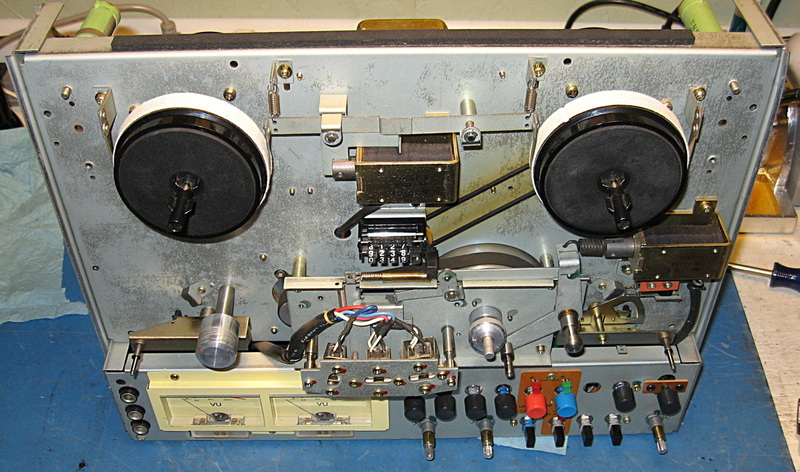 Front view of the tape deck with the plastic faceplate and covers removed. The counter belt was still intact but the original capstan belt had disintegrated into liquid tar. I peeled away as much of the goo as I could with an exacto blade and then used Awesome cleaner to remove the leftover mess. New belts are available online and both were replaced. I found the service manual online and went through the recommended adjustments and oiling while I had the deck apart. A closer view of the capstan and counter belts. Also the back of the heads are visible. The heads, capstan and capstan rubber roller were filthy with oxide and took a lot of cleaning with alcohol and rubber cleaner/conditioner respectively. 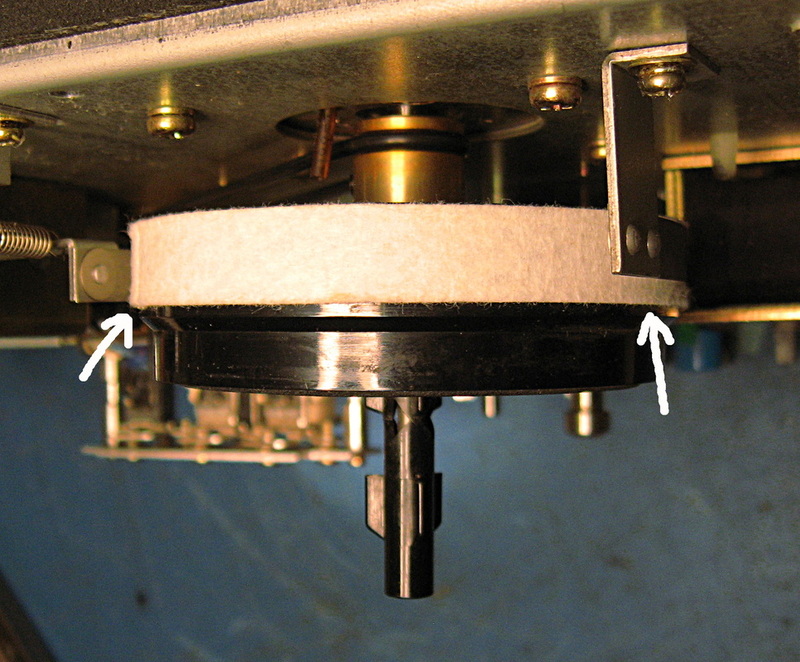 Notice the reel brake is at the front edge of the felt pad on the left but is not flush with the front edge on the right. It's actually flush along the rear edge on the right side. There's nothing wrong with the brake; the reel spindle is cocked to one side because the motor mount is bent. Both reel motors were canted the same way. I also noticed that the upper right front corner of the plastic face was cracked and the mount for that corner was broken off. It would appear the deck has been dropped, although there are no other scratches or damage to be found anywhere else. I epoxied the broken mount back to the faceplate and then removed the motors to see why they were cocked at an angle. 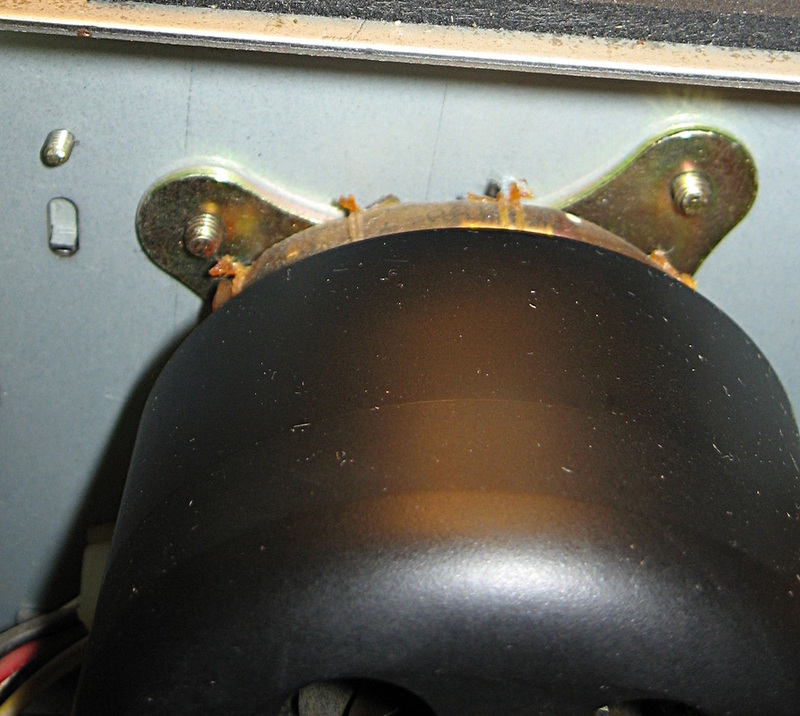 The mount for the reel motor is a metal plate with four mounting ears that screws to the front of the motor. 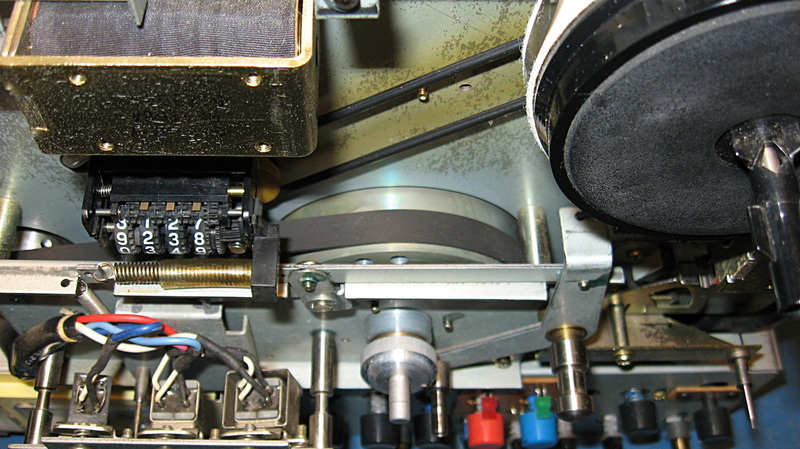 Both mounts were bent so that the motors were canted at an angle to the front of the tape deck. After removing the mounts from the motors and laying them flat on a table top, they rocked back and forth and all four mounting ears would not touch the table at the same time. I hammered them flat on a small anvil and once the motors were remounted the tape reels were again parallel with the front of the deck. The only other issue was someone had removed the deck's feet and without them the unit is a bit front heavy, which could (and possibly already did) lead to a nasty accident. I replaced the feet with two aluminum bars 1/4" T x 1" W x 7-3/4" L cut from a piece of stock purchased at my local hardware store. Now the deck is very stable.